It all begins with PNAU, an Australian electropop band that first gained attention in 2007 with their self titled album PNAU. The track, which spawned a few catchy singles ( Wild Strawberries, Baby and With You Forever) caught the attention of one Sir Elton John. Elton John signed the group and quickly took them under his wing, offering the group his musical knowledge and bubble baths. PNAU got a bit sidetracked in the late 00’s, as side project Empire of the Sun exploded onto the internet and made Nick Littlemore and Luke Steele stars for a brief moment in time. With EOTS on hiatus, PNAU went back to the recording studio, probably did a ton of drugs and decided to reimagine Elton John’s records. The result is Good Morning to the Night, a mad scientist of an album that turns parts of Elton John’s 1970-1976 discography into a cohesive summer album that is perfect for backyard patio parties. The album is only eight tracks long but features a host of an ideas. The title track incorporates eight Elton John tracks and transforms it into a rocking dance floor anthem and is definitely one of the highlights of this summer. The next track Sad is equally good, incorporating horns and other elements from five EJ tracks to turn it into once of those chilled but not too chilled tracks you want to play at sunset. 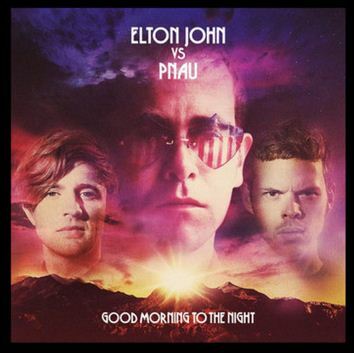 The rest of the album twist and dives into the discography (most people say it was Elton John’s best work), each track sounding slightly different but all be it consistent with the PNAU’s dance party in the desert type of sound. Basically, it’s a great summer album and one worthy of your time.